A few days back I was sipping on Manchow soup at the restaurant with my friends. It was a really well-made soup, loaded with finely shredded vegetables and perfectly balanced in taste. The topping of fried noodles was very crispy and lent a nice texture. Then I just thought to myself, how about I make a bowlful of fried noodles and pour stew over it? The stew will have strong flavors of garlic, lots of veggies and some paneer. It will be delicious and nutritious at the same time. I couldn’t wait a lot and tried transforming the idea in my head into this recipe. Since I did not have noodles, I used Maggi. You can use the hakka noodles. 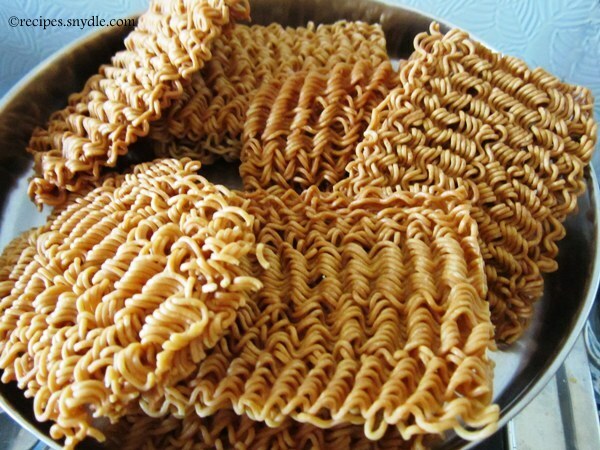 You will need to boil the noodles a bit, spread them out to dry them up and then deep-fry them. The hakka noodles will have a better taste than Maggi noodles for sure. The gravy is a mélange of sweet and spicy, and the sharp flavors of garlic will tickle your taste-buds. This recipe is for two. For the purpose of measurement, 1 cup = 250 ml. 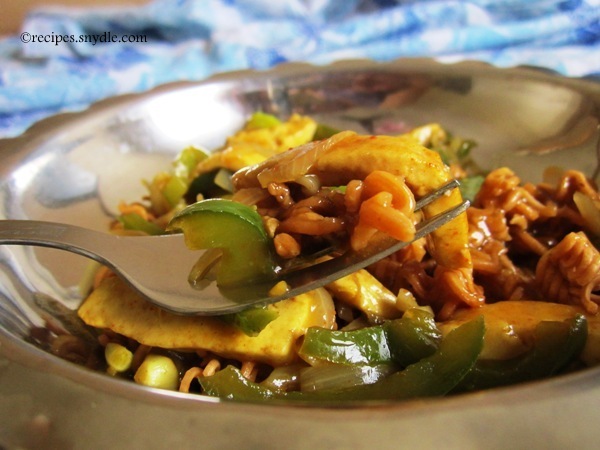 Let us see how to make the lip-smacking and delicious garlicky veggies and paneer stew. Heat enough oil in a skillet to fry the noodles. If using Maggi noodles, you do not need to boil them. Simply fry the entire bar or noodles in one go on low to medium heat till they turn golden brown as shown in the picture. Remove the noodles on to plate and keep them aside. In case you are using hakka noodles, boil the noodles first using plenty of water. Drain the noodles and spread them out on a kitchen towel to dry them. Fry them in hot oil till they turn crispy and golden. Set them aside. Now let us make the garlicky sauce. Heat 2 tbsp oil in a wok or skillet. Toss in the sliced onions and sauté them on high heat for a minute. Add in the chopped garlic and crushed ginger and sauté for another minute till the raw smell goes away and it becomes aromatic. 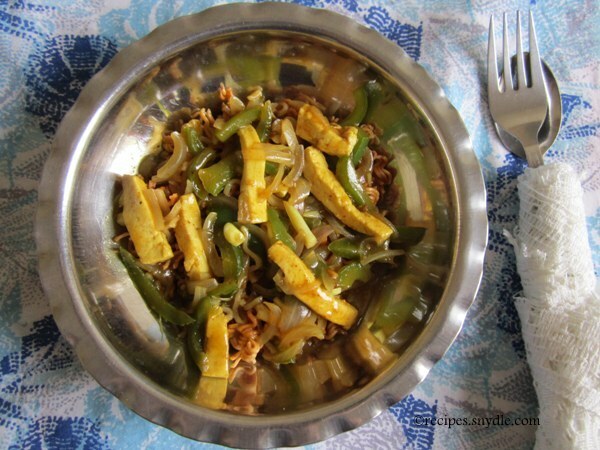 Toss in the sliced capsicum, shredded cabbage and slit green chilies and stir-fry them for a couple of minutes. Make sure not to overcook the veggies. Mix the cornstarch in water and add the slurry to the veggies. Bring it to boil. Now quickly add in the soy sauce, black pepper, red chili powder, ajinomoto, and salt. Go easy on the salt, since the soy sauce and Maggi tastemaker already contain salt. The gravy will have thickened up a bit now. After half a minute, add in the Maggi taste maker, sugar and vinegar and stir it around. Toss in the paneer and turn the heat to low. Allow the gravy to simmer away for a minute; not longer than that else the paneer will turn rubbery. We don’t need very thick gravy. It should be just soupy. It’s time to assemble the noodles and gravy. Take a bowl and crumble the noodles lightly and place them in the bowl. 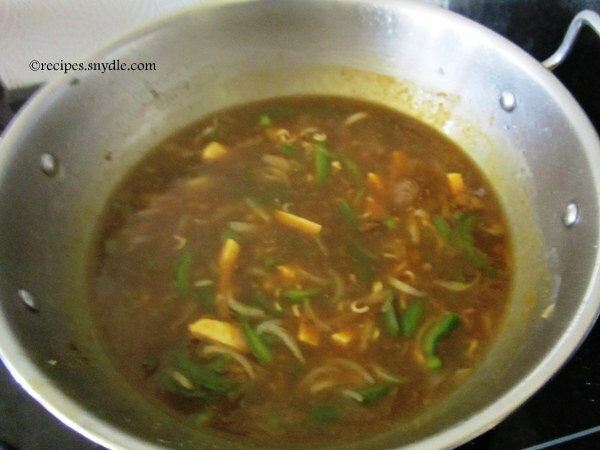 Now pour ample gravy over the noodles so that they get completely drenched in it, and serve it hot. Garnish with some chopped greens of spring onions to complete the dish (I didn’t use them since I didn’t have them at the time). 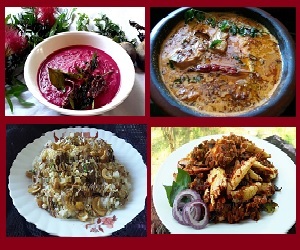 A complete meal in itself, this dish is tangy and spicy at the same time. Not to mention how comforting and filling as well. Enjoy the bits of succulent paneer and crispy veggies as you relish the dish on the winter evenings with your family and friends.